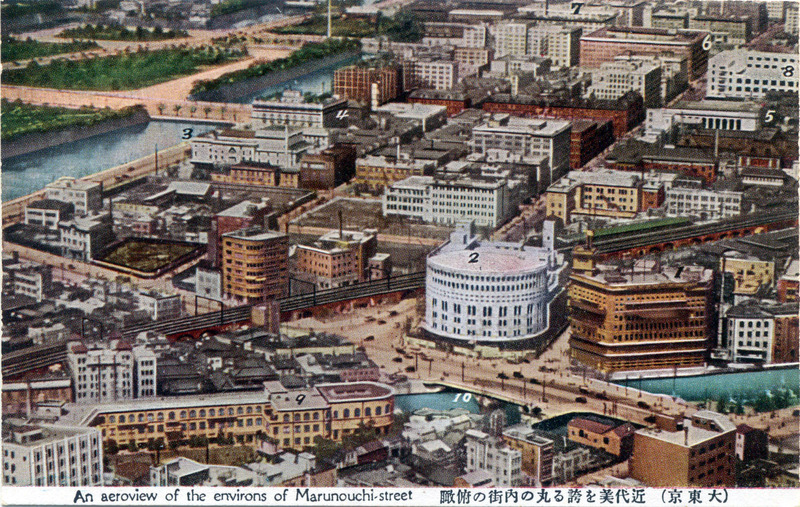 Aerial view of Yurakucho and the Marunouchi business district, c. 1930. (Above:) 1. 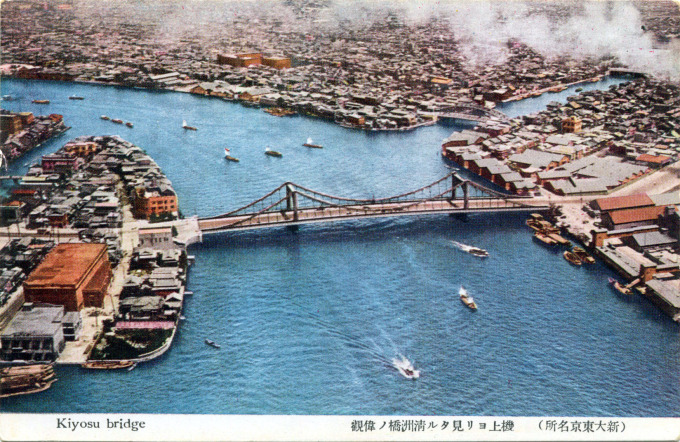 Asahi Shimbun (Newspaper); 2. 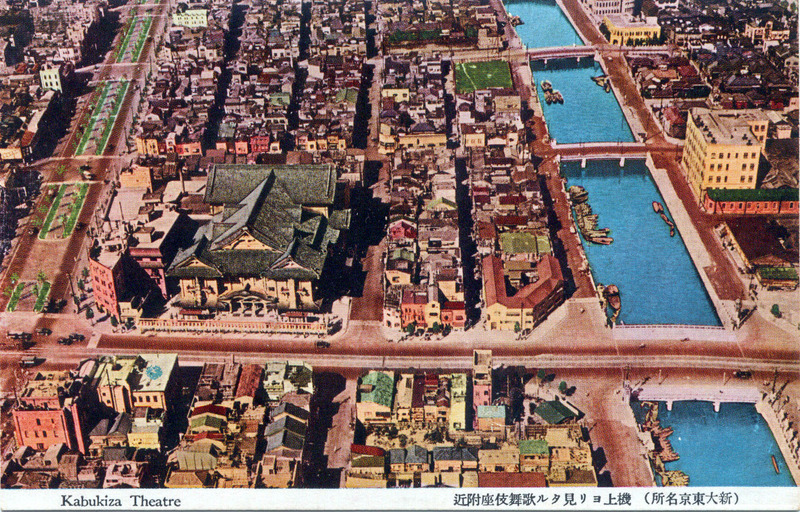 Nichigeki Theater; 3. Imperial Theater; 4. Tokyo Kaikan; 5. 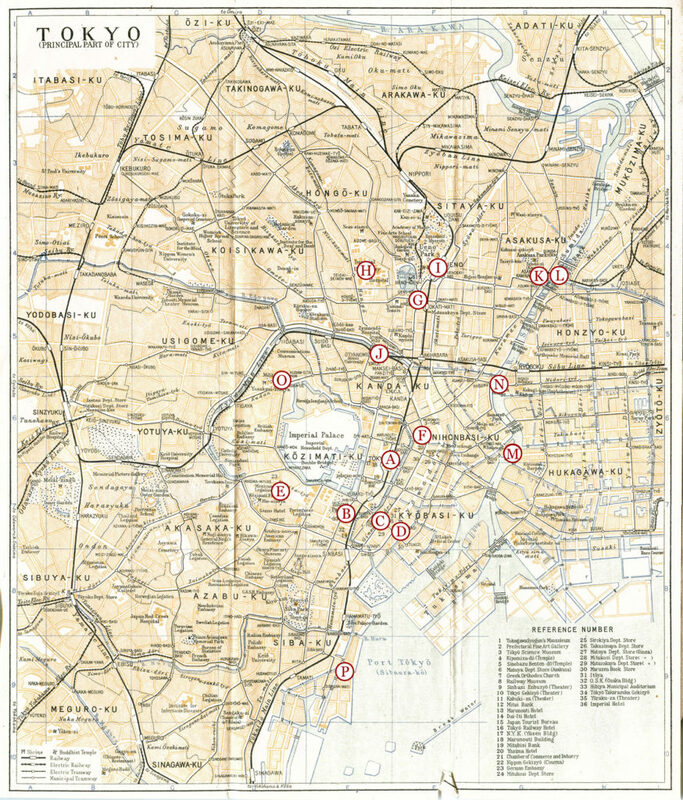 Tokyo Metropolitan Office; 6. Marunouchi Building; 7. Kaijo Building; 8. Central Post Office; 9. 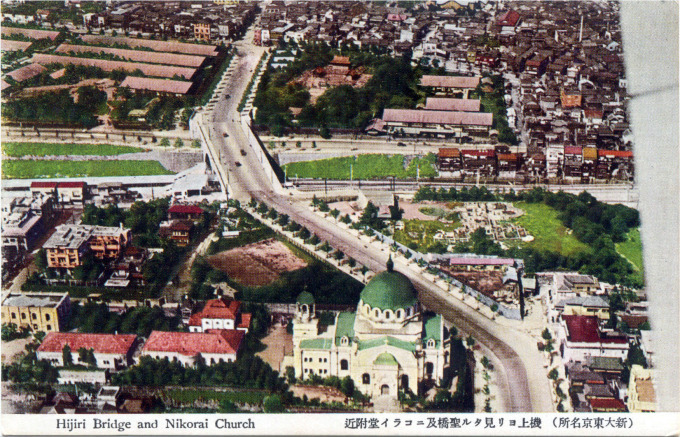 Tamei Primary School; 10. Sukiyabashi Bridge. 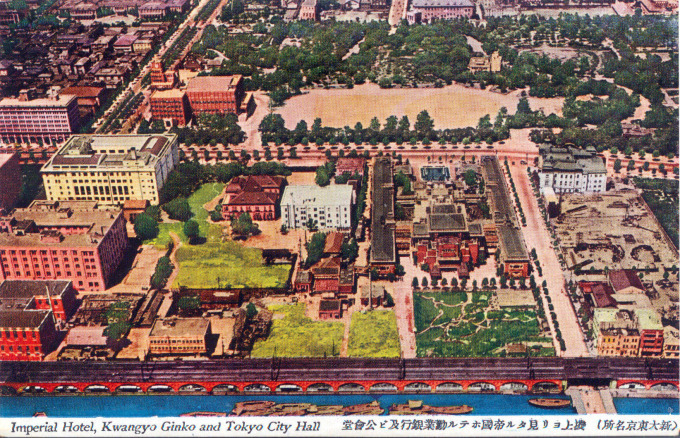 A. Aerial view, Tokyo Station, c. 1940. 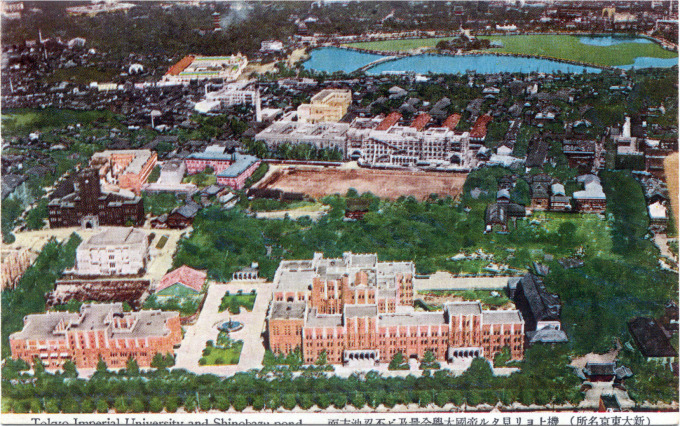 B. Aerial view of the Imperial Hotel, c. 1940. C. Aerial view of Ginza Crossing, c. 1940. D. Kabukiza, aerial view, Tokyo, c. 1940. 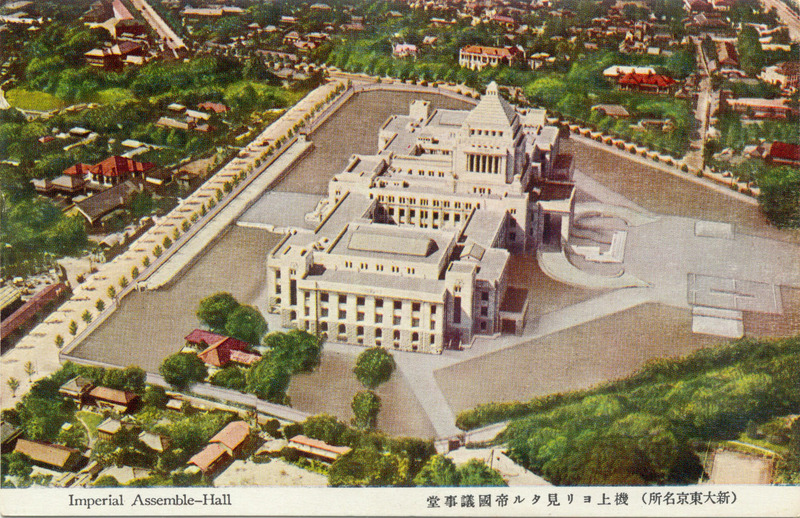 E. Aerial view of the Imperial Diet Building, c. 1930. 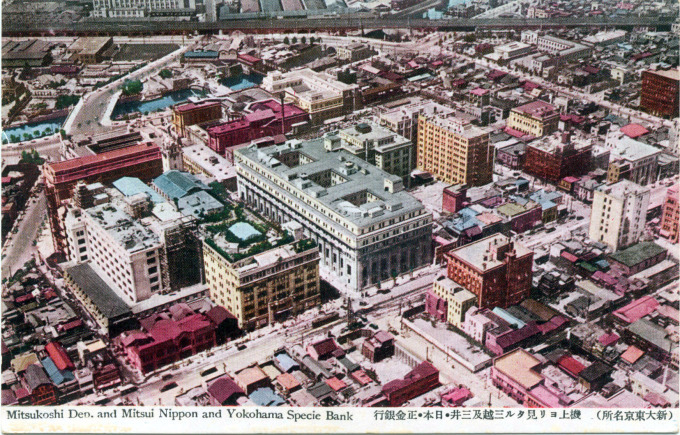 F. Aerial view of Mitsukoshi department store (left), Nihonbashi, c. 1940. 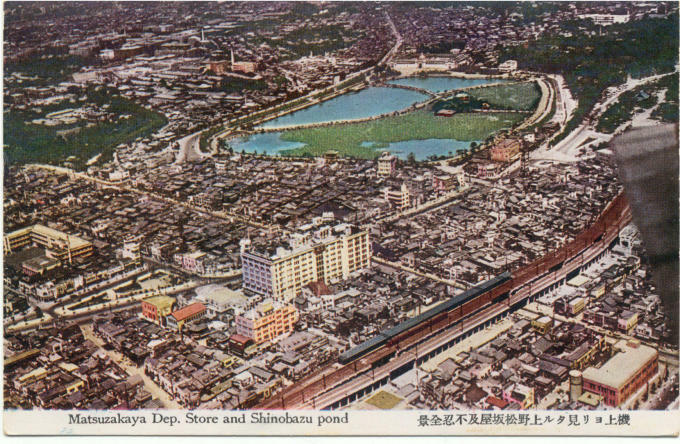 H. Aerial view of Tokyo Imperial University and Shinobazu Pond, Ueno, c. 1940. 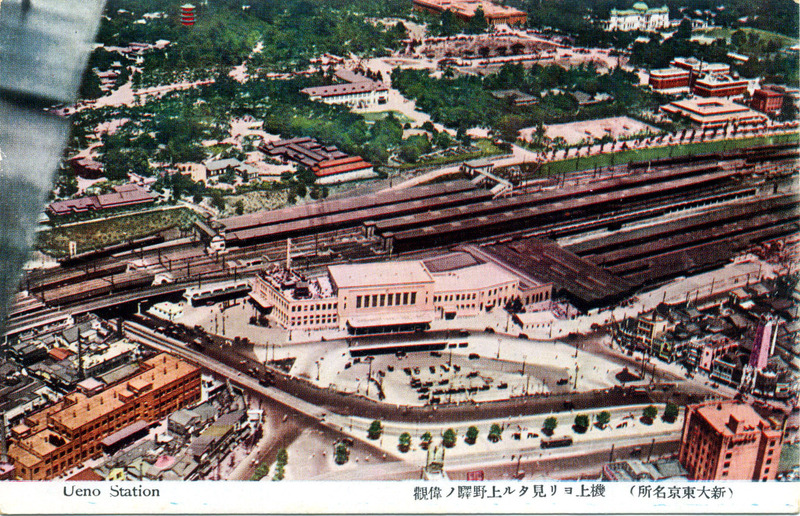 I. Aerial view, Ueno Station and Ueno Park, c. 1940. J. Hijiri-bashi at Ochanomizu,with the Nikolai Cathedral (foreground) and Yushima Seido Temple (upper-center) c. 1940. 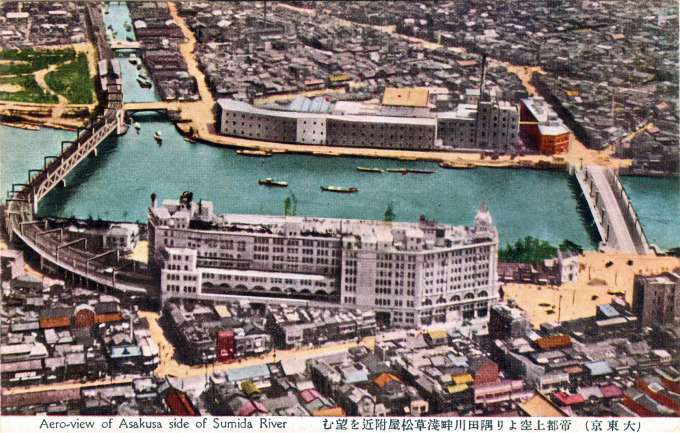 Aerial view of Matsuya Asakusa and the Asahi Brewing Co., c. 1940. 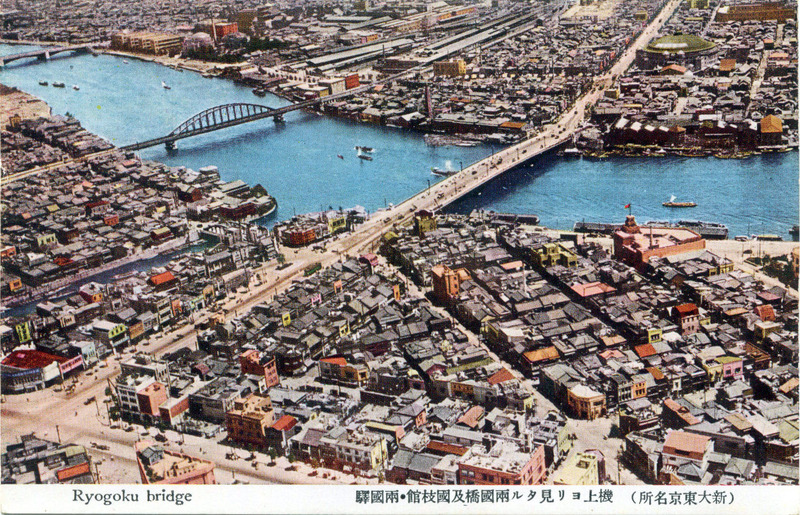 Kiyosu-bashi aerial view, spanning the Sumida river, c. 1940. 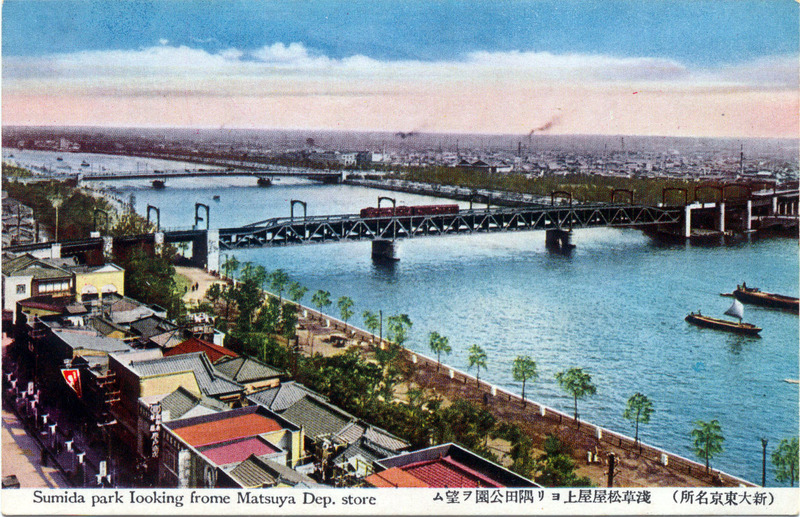 M. Tobu railway bridge (foreground) and Kototoi-bashi at Sumida river park, near Asakusa, c. 1940. 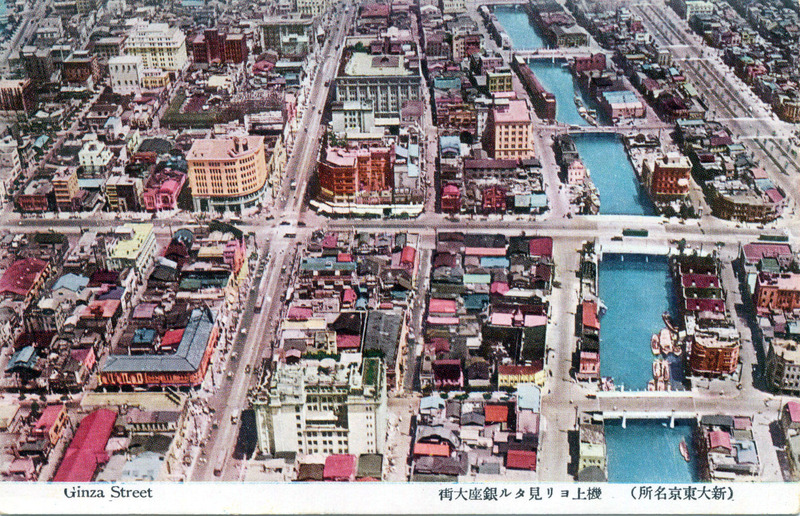 N. Aerial view of Ryogoku-bashi (center) spanning the Sumida river and, in the upper right, the Kokugikan sumo hall, c. 1940. 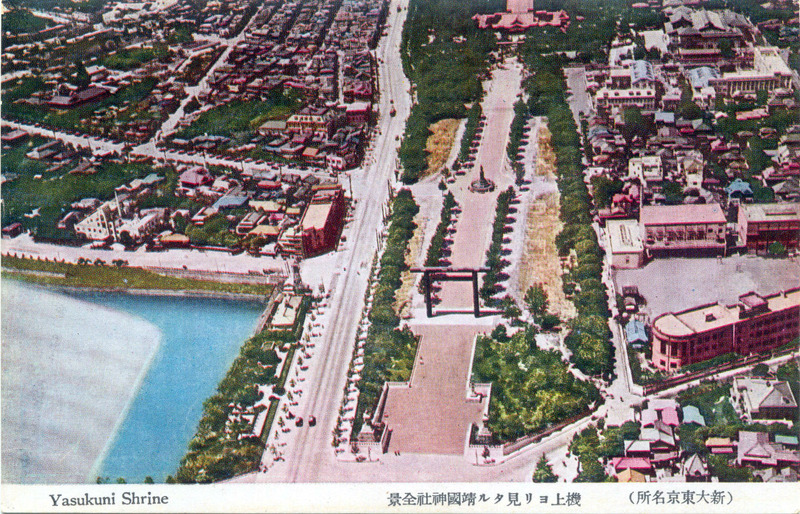 O. Aerial view of Yasukuni shrine at Kudanzaka, Tokyo, c. 1940. 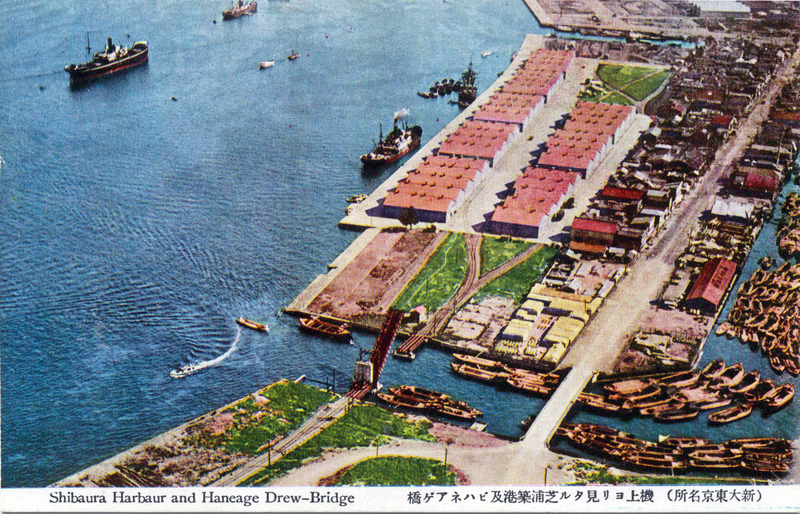 P. Aerial view of the Shibaura dock and wharf, c. 1940. Map: Tokyo aerial views, c. 1940. 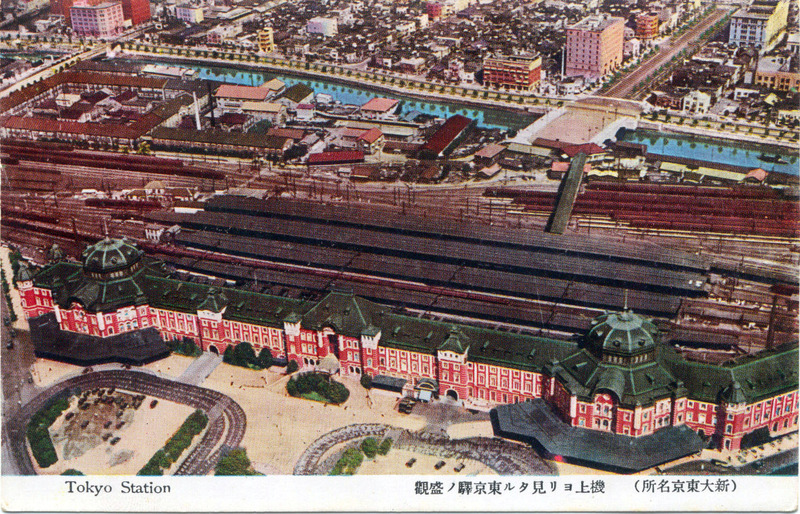 Key for postcard collection above.